On the surface, Katherine (Florence Pugh), the young wife slowly being suffocated by her airless existence inside a country manor house in 1860s England, would seem to have little in common with the villainess of Shakespeare’s classic play. Katherine doesn’t share her husband’s ambition; in fact, she and Alexander (Paul Hilton) share very little, as he’s often away and openly contemptuous toward her when he is around. And she’s not driven mad with guilt over her actions over the course of the film. If anything, she reveals herself to be more of a psychopath with each passing scene. But like the doomed queen of Scotland, Katherine is cold-blooded in her pursuit of power, and her steely determination to punish those who have underestimated her almost makes her a feminist antihero. Almost. Because where William Oldroyd’s costume thriller succeeds is in taking a scalpel to institutions of power and the varying levels of privilege that they afford. Just as Katherine is victimized, she victimizes others: Her father-in-law, Boris (Christopher Fairbank), the very image of the white Christian patriarchy, tells her that he considers her to be nothing more than a piece of property, a vessel through whom the business transaction of producing a male heir can be made. But she, in turn, treats her black maid, Anna (Naomi Ackie), and working-class lover, Sebastian (Cosmo Jarvis), as interchangeable pawns in a twisted game of psychosexual chess. 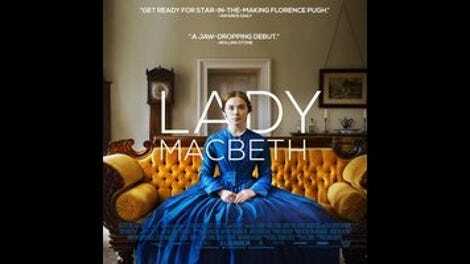 At first, Lady Macbeth looks suspiciously like your average period drama, lushly costumed and meticulously detailed, carefully composed in wide, still shots and lit with warm candlelight and pale, thin daylight under perpetually gray skies. But when Alexander orders Katherine to undress and face the wall on their wedding night, we know right away that something is inescapably rotten here. At first, we feel sorry for Katherine, stuck in a monotonous daily routine of getting up, getting dressed, eating breakfast, and perching uncomfortably on the parlor couch, prim and stiffly upright in her hoop skirts. (“Go read your prayer book,” is Boris’ perpetual comeback whenever Katherine tries to participate in the affairs of the estate.) We’re happy for her when she overcomes her initial resistance and throws herself headlong into a hedonistic affair with farmhand Sebastian, wantonly screwing him in every dusty room in the house. But then Katherine’s newfound freedom is threatened, and the kitten begins to flex her claws. Anna, meanwhile, serves as the film’s conscience, registering her disapproval with sideways looks and extra-rough scrubbing at bath time. At one point, unable to express herself in words, she steals away to the landing atop a staircase and screams silently into her hands. The contrast between Anna’s fearful prudishness and Katherine’s amoral detachment—and the unspoken tension between them, an electric current that runs between the two actors—is put to striking effect in a scene about halfway through the film when Katherine calmly serves Boris a deadly mushroom for dinner, impassively sitting and stirring her tea as the poison takes effect. She turns to address Anna, standing nearby and watching with wide, terrified eyes. Katherine gestures to the table, set for two, and gently says: “Sit down, Anna.” Anna doesn’t respond. More harshly this time: “Sit down, Anna.” And guess who’s going to take the blame? This is only the start of a slow-building crescendo leading to a stunning final scene that suggests that, while Katherine may have turned to cruelty as an act of rebellion, she did so at the price of her soul. In its second half, the film begins to drag and thus lose focus, handicapping itself as it attempts to elicit gasps from the audience in late scenes of shocking violence. Overall, though, the strength of the performances and the audacity of the subject matter are enough to keep Lady Macbeth riveting, with increasingly claustrophobic mise en scène and a breathlessly still soundtrack—the film features no music at all until the third act—creating a sense of emptiness to match Pugh’s disturbingly stoic gaze. By engaging with multiple forms of oppression, the film forms a radical statement on the intersections of racism, classism, and sexism that elevates it far beyond a nicely shot, Victorian-era episode of Snapped.